World-famous street artist Banksy unveiled a new mural today, Dec.11, in the sprawling refugee camp in Calais, France. The painting portrays Steve Jobs, legendary founder of Apple, as a Syrian refugee. 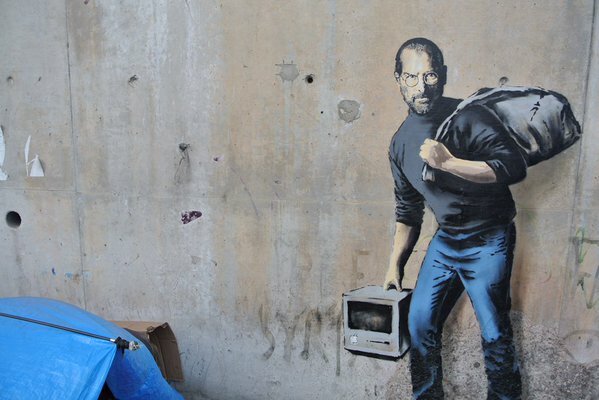 In the mural, Jobs carries the original Apple computer, and a large black sack over his shoulder. Jobs’ father, Abdulfattah “John” Jandali, was born in Homs, a city now ravaged by Syria’s brutal civil war, in 1931. He studied at the American University in Beirut, and then came to the US to continue his education at the University of Wisconsin. There he met Joanne Schieble, who would become Jobs’ biological mother. The couple gave the baby up for adoption in 1955 in San Francisco. “Steve is my biological son, but I didn’t bring him up, and he has a family that adopted him. So if it’s said that I’m the ‘father of invention’, then that’s because my biological son is a genius and my daughter [novelist Mona Simpson] a brilliant writer.